How to start a blog! I love cornbread! It might just be a southern thing but give me a plate of cornbread, white beans, and cabbage and I’m golden. Skillet cornbread typically turns out dry and crumbly for me. 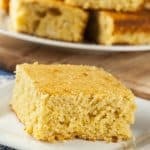 Since I have this cornbread problem I was on the search for a yummy moist sweet cornbread recipe and then I found this one. It is two thumbs up! 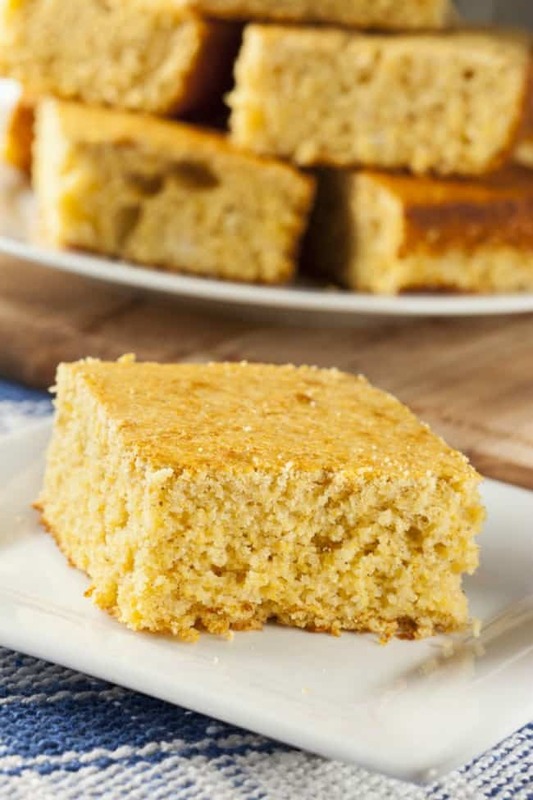 It is so moist and has the texture of a cake but tastes like sweet cornbread. So incredibly good! 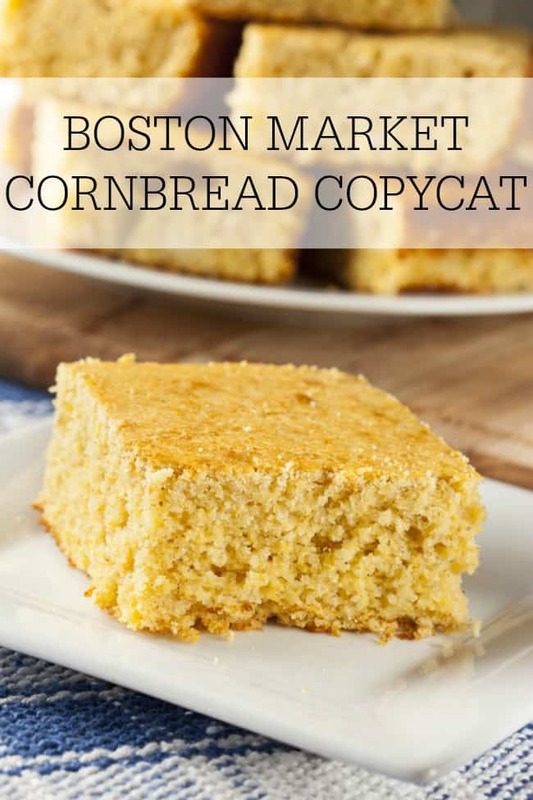 If you love sweet and moist cornbread then you have to give this Boston Market Cornbread Copycat a try. Note: You can substitute the butter golden cake mix for just yellow cake mix but it might end up sweeter and taste more like cake rather than cornbread. The butter golden from Duncan Hines will give you the best cake-like but still taste like cornbread recipe. Preheat oven to 350 degrees. Mix in a large bowl the muffin mix, cake mix, water, milk, eggs, and butter. Combine and place into a 9×13 dish. Cook on 350 for approximately 30 minutes. If your fork comes out clean (just like baking a cake), it’s done. Do you want to print this recipe? Mix in a large bowl the muffin mix, cake mix, water, milk, eggs, and butter. Combine and place into a 9x13 dish. Cook on 350 for approximately 30 minutes. If your fork comes out clean (just like baking a cake), it's done. This sounds delicious! Years ago a neighbor gave me a cornbread recipe she called Hawaiian Cornbread. It is really good, but takes a little more time and effort than the one you are posting because you have to measure out all the ingredients (no mixes were used). I’m going to try yours. Oh, love cornbreads too. And that looks so scrumptious! I am also inviting you to join Tiddle Diddle Handmade Shoppe’s first giveaway event. Thanks so much for stopping by and following on pinterest. Planning on making this for my best friends and their husband/boyfriends during a ski trip in a couple weeks. Just concerned about how much Jiffy to use. At the top of the ingredients you list 2 Jiffy and 1 Duncan Hines, then at the bottom it’s 1 muffin and 1 cake. Clarification please? Oh my goodness! I didn’t even realize I typed that wrong. It is definitely 2 boxes of jiffy mix. Thanks for letting me know about the mistake. @2012 - 2019 - Today's Creative Ideas. All Rights Reserved.